Hi everyone. It's Friday (already) and for me, this week went very quickly. How about yourselves? I hope things have been good for you. It snowed again today and not for very long or extremely heavily in my area, but once again the news is filled with reports of people being stuck in cars for hours. One story on the news today was that of the situation with the post office. Apparently there are 4 million packages just sitting in depots, waiting to be delivered but as the roads are so perilous at the moment, those packages can't be delivered. Cue the shot of the poor little DHL guy throwing grit on the snow around where his van was parked, just so that he could get out and do his job. When I was younger I used to welcome the snow. Now that the UK seems to be unable to handle a few inches of snow in so many hours (for whatever reason; I'm not about to go all political here) I start to panic and think about stocking the cupboards with formula, nappies, tins of soup...lol! I told the husband that if we can't get to the shops in the next few days, we'll have pizza from the freezer for Christmas dinner! Today I'm going to show you two frankens made by Krisinphilly at My Lucid Bubble. The first is Sargasso Holo(graphic), the one I named. 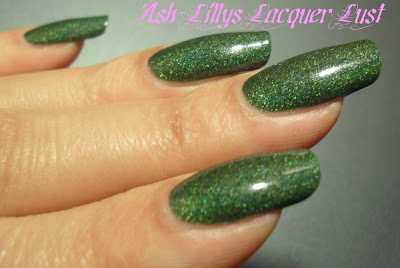 This is a lovely dark green holo. There's not much I can really say about it because I think it speaks for itself. Do you like it? Next is Green Snake, which is a little lighter. L-R Sargasso Holo and Green Snake. Sorry this picture is so terrible - I had to use the timer on the camera for this and then chop the picture to bits! When I was out today (before the sky collapsed) I saw a few sales assistants taking a few quick looks at my fingers today. I'm not surprised. I've been gawping at them all day too. By the way...are the bigger pictures better? I think they are but you the ones reading so let me know what you think? Both are great but Sargasso is my favorite. And yes, the pictures are bigger. Thanks Karen. I read my typo and I'd actually meant to ask if the bigger pictures were better, lol!